Yesterday, some members of the journalism community in Colorado violated that principle and the standards of journalistic ethics. The good news was that others in our circles were unafraid to take a public stand against those violations. It happened during another horrific scene in Colorado. To me, it felt like a surreal end to a last day at a job that’s been punctuated by criminal or natural tragedies. I’m sorry to say it, but the routine was so practiced for us that every member of our team knew what to do and who to call. Meanwhile, a reporter I’ve never heard of decided to do something that many of us found dangerous, offensive and – frankly – surprising. In her race to be first, she decided to tweet the play-by-play action that she was hearing over the police radios. That included information about police positions and the number of people hurt so far. That alone should have pointed out why the rest of the journalistic community was upset with the reporter’s decision. If that truly was the gunman who called during the 5+ hour standoff, it is clear proof that he was watching coverage of the situation. The information she was publicizing about victims could have encouraged him and the information she was sharing about police positions would have empowered him to cause more harm. It is unthinkable to me and many of my like-minded colleagues that someone in our field would so recklessly share unconfirmed information and then argue it was her right because it came from public police radio channels. It is her right, but that doesn’t make it the right thing to do. This reporter has a small following of only a few hundred people, but word of her unconscionable assignment spread quickly. Many of the other journalists in town asked her to stop. When we were ignored, we reached out to her editors. I am flabbergasted that her editor actually defended the reporter (repeatedly), saying they wanted to provide updates to the public, but never clarifying exactly how these details might be useful. To me, it seems the only potential audience with a use for much of that information would be the killer himself. I hope that was just a bad choice of words and not another violation of journalistic standards where she is cheering for someone — even a mass killer — to be executed without trial and due process. The race to be first is primarily a race among journalists. The race that really matters to consumers is the race to attribution and context. I do not believe that consumers ever take us at our word. They no longer trust journalists in that way. 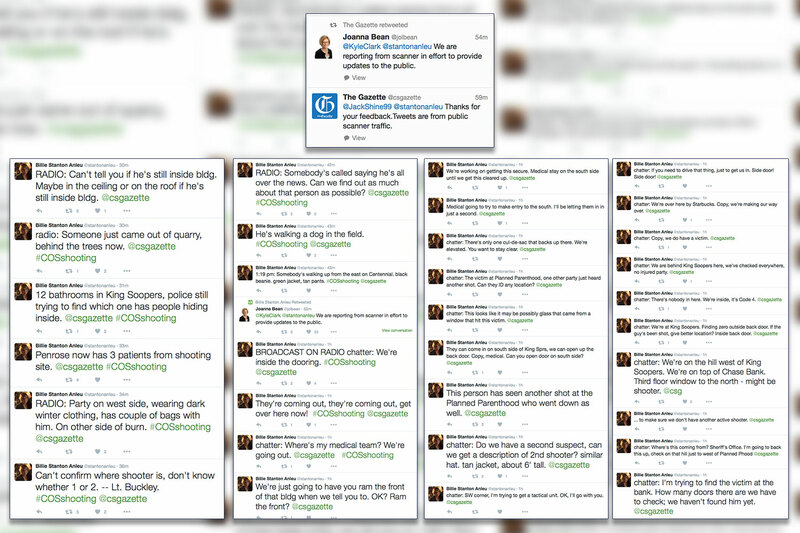 When someone sees an early tweet or alert message about a piece of breaking news, they go deeper to evaluate it. If a news organization was first but has no depth or no explanation, that user will move on to a post that does contain those valuable pieces of context. Consumers remember our industry’s inability to get things right, like the conflicting reports on how many were killed or wounded at Umpqua Community College. Those memories make consumers doubt our work, and they are right to feel that way. I don’t want my teams to be late to the news, but I also don’t need them to be first at everything. I want to run toward quality and trustworthiness, thereby creating a good experience for consumers.